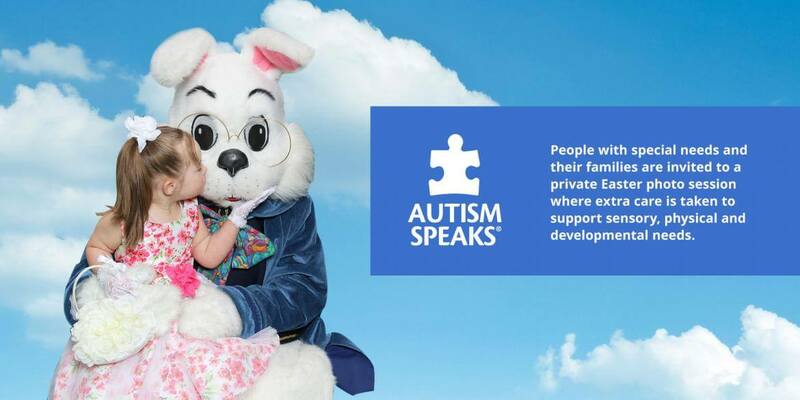 April is World Autism Awareness Month and The South Bay Galleria has partnered with Autism Speaks to bring a very special event with the Easter Bunny to those children who need a little more special experience. The Bunny welcomes all ages and abilities! This compassionate event allows people with all spectrums of special needs to experience the time-honored tradition of a visit with the Easter Bunny, in a comforting environment prior to public hours. Accommodations are made to support the sensory, physical, and developmental needs of this special audience. Bunny Cares is held in partnership with Autism Speaks. Autism Speaks is dedicated to promoting solutions, across the spectrum and throughout the life span, for the needs of individuals with autism and their families. They do this through advocacy and support; increasing understanding and acceptance of autism spectrum disorder; and advancing research into causes and better interventions for autism spectrum disorder and related conditions. Visits with The Bunny are welcome and free. Space is limited and families are encouraged to reserve a time in advance at: www.AutismSpeaks.org/Bunny. Easter photo packages will be available for purchase during the event.